This was supposed to be the year of the iPad's crowning triumph in education--its adoption by and distribution throughout the nation's second-largest school district, Los Angeles. Events haven't quite turned out as planned. A $1 billion iPad-distribution program that started in the fall has run up against a series of obstacles. Students hacked their way past the tablet's security; parents raised concerns that they were liable for iPad damage; and the program ran into cost overruns. Put all that together and the result is that officials recalled the iPads while they rethink their plan. Reportedly, the conflict even put Superintendent John Deasy's job in jeopardy at one point. "It's an ambitious project, involving lots of money, so there were probably going to be some problems coming out of the gate," said Michael Janofsky, managing editor of L.A. School Report, a blog that tracks education issues in the city. It's no boon to Apple that its highest-profile iPad implementation in public schools has also been its most problematic. The company has heavily targeted the education sector--the company said in June that more than 10 million iPads had been sold to schools around the world. "As the most high-profile iPad deployment in the world right now, a lot rests on [Los Angeles] getting it right," wrote blogger Fraser Speirs, head of computing and IT at an independent school in Greenock, Scotland. 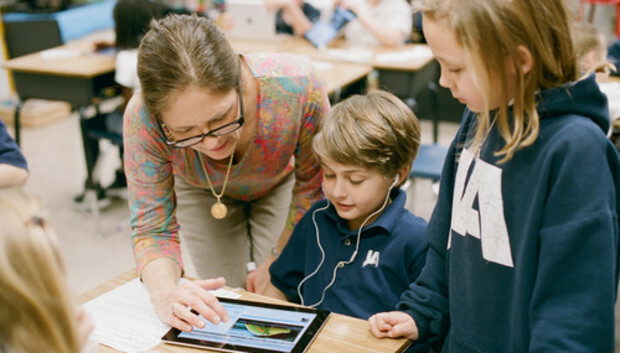 Speirs was among the first educators to implement widespread iPad distribution in the classroom. But it's also true that teachers and students around the world are already using the iPad to good effect. So Macworld talked to several experienced hands about the best way for schools to transition to tablets--guidance that Los Angeles officials might consider as they plot a new path forward. None of the experts who spoke to Macworld wanted to comment directly on the problems in Los Angeles. But they did offer consistent advice about how schools should bring iPads into the classroom. Take your time: In many schools, iPads arrived in classrooms only after a planning process that spanned three or more years. In Los Angeles, by contrast, the school board voted in June 2013 to proceed with the project, with the first tablets reaching students hands just a couple of months later. "I don't think you need to take five years to plan this," said Eddie Wettach, dean of technology at Jackson Academy, a 1300-student private school in Mississippi. "But six months or even a year is a pretty fast pace." San Diego, which has 135,000 students and--before L.A.--was one of the largest public school districts to begin distributing iPads to its students. The district created a five-year technology plan--the first tablets were used in just ten of the city's schools before wider adoption began in years four and five. "Schools have learned a lot from these ten pilot schools about creating a culture of respect and appropriate use," said Darryl LaGace, who was the district's IT director for most of the time period. "If we as a district had leapt into handing them out from day one, we probably would've made a mistake." Discovery Education helps school districts develop their technology plans. Scott Kinney, senior vice president of education outreach, policy, and professional development, said those plans often take three to five years to implement. And the process starts with deciding how technology can serve the education of a district's students. Some educators, experts say, have been willing to start buying tablets simply for the "shiny new toy factor," without first figuring out how they'll fit into the curriculum. "That strategy starts with, What are your instructional goals?" Kinney said. "The last decisions we would advocate to make are your hardware decisions." That's the approach now being taken in Maryland's Baltimore County public schools, a 108,000-student district that will begin an iPad pilot program next school year in just ten schools, and only in the first through third grades. "The instructional side is driving this. We're listening to our teachers," said Lloyd Brown, the district's executive director of information technology. "We're not letting the device drive what we put out there in our schools." Teach the teachers: Before they can use iPads in the classrooms, the experts say, teachers must be taught how to use them to further their students' learning. In San Diego, for example, teachers are given two full days of "professional development" training on how to use the tablets to enhance education. "A big part of it is ensuring teachers have some lead time to get ready for it," said Patrick Larkin, the assistant superintendent for learning in Burlington, Massachusetts, which distributed 1200 iPads to its high school students two years ago. "For most teachers, having these types of devices in their classrooms is totally foreign. It's hard to get your head around." In Mississippi, Wettach said teachers at Jackson Academy were given their own MacBooks four years before students were given computers. The year before students received iPads, teachers were given access to a cart of tablets to check out for preliminary use in the classroom. "By that time," he said, "it was an efficient teaching tool." "You can't simply take a textbook out of somebody's hands and replace it with an iPad, MacBook--any technology--and just say, teach differently.'" Kinney added. In one district, he said, Discovery Education provided teachers with a three-year schedule for the training sessions they would receive with the iPad before using it in the classroom. "Just providing a road map for people takes a level of anxiety off." One size does not fit all: Wettach's school ended up distributing iPads only to first- through fourth-graders. Fifth-graders and above--all the way to high school seniors--get MacBook Air laptops instead. Similarly, the Mooresville Graded School District in North Carolina distributes iPads to students in kindergarten through second grades. "The right tool for the right kid is what we try to do," Wettach said. "The iPad is cheaper, and that's one reason to go to it. If you're in senior English, it's going to be harder to type a research paper." Be proactive (and flexible) about security: The Los Angeles school district's iPad distribution ran into problems when, officials said, the first students to receive the tablets "hacked" their way past security restrictions. The district hasn't offered a more detailed explanation, but observers like Speirs believe the students simply reset the iPad settings so they could use the tablet for relatively mundane purposes like browsing the Web on Safari. Some of those problems can be resolved with use of third-party mobile-device-management services that can control which apps are allowed on the machines; Speirs, for example, uses Casper Suite from JAMF Software to exercise that control. In Mooresville, the district protects technology by requiring students and their families to have skin in the game--every family pays a $50 tech fee before receiving an iPad. (Families that qualify for free or reduced-fee lunch can apply for a fee waiver. Families can also lighten the immediate financial burden with a payment plan.) The district has an acceptable-use policy, and kids and their families are trained together in responsible use: If the iPad becomes unusable because it was used in a way that violates the policy, the family pays for the repairs. "They have to understand what we're putting in their hands," said Scott Smith, Mooresville's chief technology officer. "We don't just put it out there willy-nilly." Promote digital citizenship: Locking down iPads isn't necessarily the primary strategy schools are relying on. The arrival of the iPad and other technologies in the classroom has spawned a burgeoning "digital citizenship" movement, in which students are given education (and some latitude) in the proper ways to use the devices they've received. Digital citizenship is being emphasized in most schools that Macworld surveyed, including the San Diego, Baltimore County, Mooresville, and Jackson Academy schools. "It's an area that hasn't really been taught before," said Mooresville's Smith, who pointed to Common Sense Media as providing a particularly effective digital citizenship curriculum. "Kids will be kids, they always will. But in my opinion, that's a great learning opportunity, a teachable moment,' says Scott Smith." Speirs, meanwhile, made sure that Angry Birds was installed on his students' iPads. "You can enforce obedience through technical means," he wrote, "or you can use all the carrots, sticks, honey, sweets, jokes, cajoling, and nudging that real, sustainable cultural shifts require to move your organization to a better place." Baltimore County's Lloyd Brown said flexibility is key: An iPad that is too tied down with restrictions isn't really a useful machine. "Kids will be kids, they always will. But in my opinion, that's a great learning opportunity, a teachable moment,' said Mooresville's Scott Smith." "It's going to be a tough balance," he said. "It's going to be one of those lines in the sand where you can move it and know it won't be a permanent line." Of course, many of the schools and districts that have successfully implemented iPads are considerably smaller than Los Angeles. "I think the idea going in was, as the second-biggest district in the country, this would be the most ambitious program to get tech in the hands of kids, including some who wouldn't have access to it otherwise," said Janofsky, the Los Angeles journalist, "In that sense it was very honorable, but the devil is in the details." Discovery Education's Kinney, though, doesn't believe L.A.'s size should be a hindrance. "We've worked with a number of urban districts," he said, including Miami-Dade County in Florida. "Those are complex organizations....I don't think it's impossible by any means." The future, in fact, may be impossible to avoid. "Every school has to do it. It's just a matter of when," Wettach said. After 15 months, Larkin's Massachusetts district finally started distributing iOS devices at the elementary-school level this year. The result of their preparation--planning, training, and targeting of resources--is that teachers and students are ready to use technology when it enters the classroom. As Larkin said: "Now we have teachers saying, When do I get my iPads?' Instead of What do I do with my iPads?'" « Mavericks Dictation vs. Dragon Dictate: How good is OS X's built-in tool? The Future Is Here, So Where Are The eBooks?